There have been quite a few cases where website mishaps have enabled travelers to snap up airline seats at absurdly low prices, but here’s a story in which someone found themselves at the complete opposite end of the scale. The peculiar tale began earlier this week when U.K.-based Debbie Andrioli hit British Airways’ website to book a vacation for her family of five, The Independent reported. Ms. Andrioli’s desired destination was Mexico’s Riviera Maya, an idyllic spot on the country’s Caribbean coastline. Having input the dates and other details, she hit the “continue” button to proceed with the reservation. But there was a bit of a snag. The website quoted her 636,000 British pounds (about $840,000) per person for the two-week trip, bringing the total cost to 3,178,612 pounds (abbot $4.2 million) for the entire family. 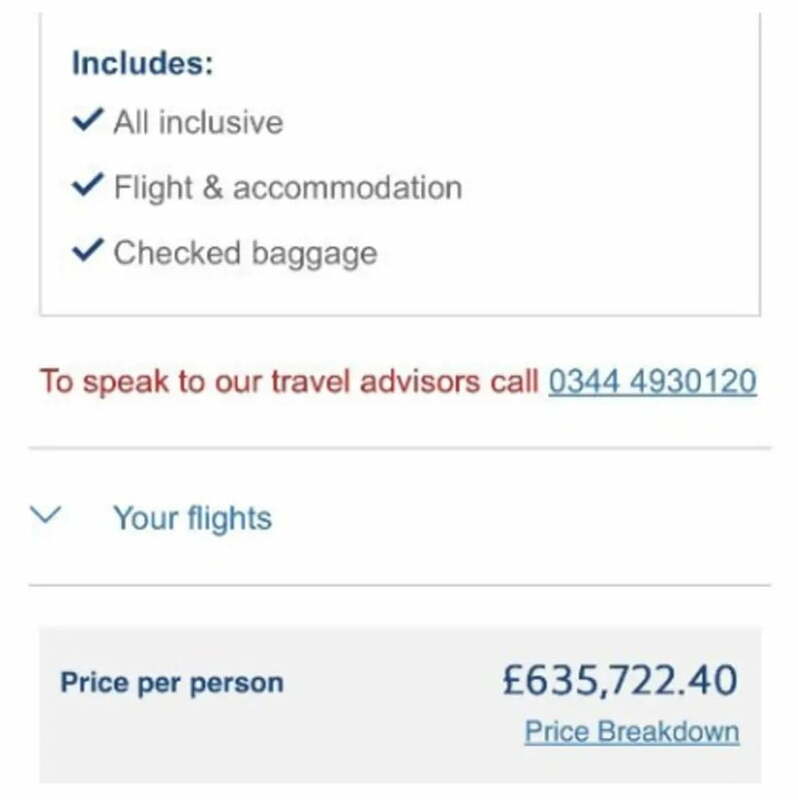 Sure, it included flights, accommodation, and other extras, but, as The Independent noted, it was still around 200 times more expensive than what you would ordinarily expect to pay for such a trip. Responding to the bizarre error, a spokesperson for B.A. said: “We always want our customers to feel like a million dollars when they’re on holiday with us, but our holidays to Mexico start at 843 pounds per person, so nobody ever needs to pay that much.” Lucky she didn’t hit the “book” button, then. As we mentioned at the top, airlines’ computer systems do occasionally spit out absurdly cheap flight tickets, with Cathay Pacific recently messing up not once, but twice in the space of just a couple of weeks when it accidentally sold $16,000 first-class seats for just $1,100. Luckily for those quick enough to make a booking, the Hong Kong-based airline agreed to honor the reservations. It doesn’t always work out so well for quick-witted travelers, though. United Airlines, for example, canceled a number of first-class reservations in 2015 when a bug on its website caused the fares to display at way below the correct price.